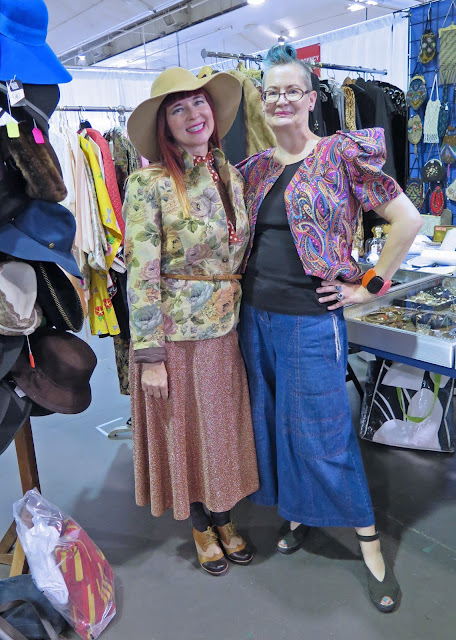 I hadn't been to the Toronto Vintage Clothing Show for a couple of years so when my friend Suzanne invited me go to the fall edition of the show with her on October 1st, I happily agreed. The show is held in the Queen Elizabeth Building at Exhibition Place in Toronto twice a year, and features between 90 - 100 vendors selling vintage clothing, accessories and housewares. Both Suzanne and I wore pieces we had purchased secondhand. 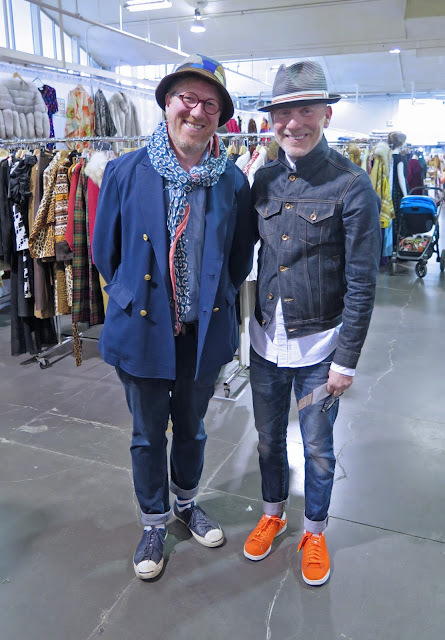 My 1980's jacket and Annie Thompson denim pants were found at Talize. As our styles are very different, and I needed to get some photos for this post, we went off in separate directions and agreed to meet up in a couple of hours. I find if I choose a theme when I'm taking photos at vintage shows it's easier than just trying to photograph everything, so this time, as Fall is officially here (although you would never know it from the warm temperatures we've been having), I decided to focus on colourful coats. Unlike new winter coats, which seem to be primarily black, vintage coats come in all colours and patterns. 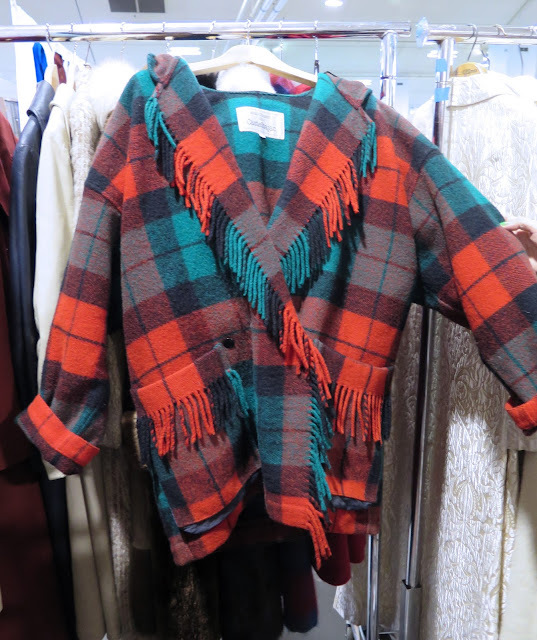 I saw several plaid wool coats but the combination of orange and turquoise in this fringed one from Phoenix Vintage made it stand out. 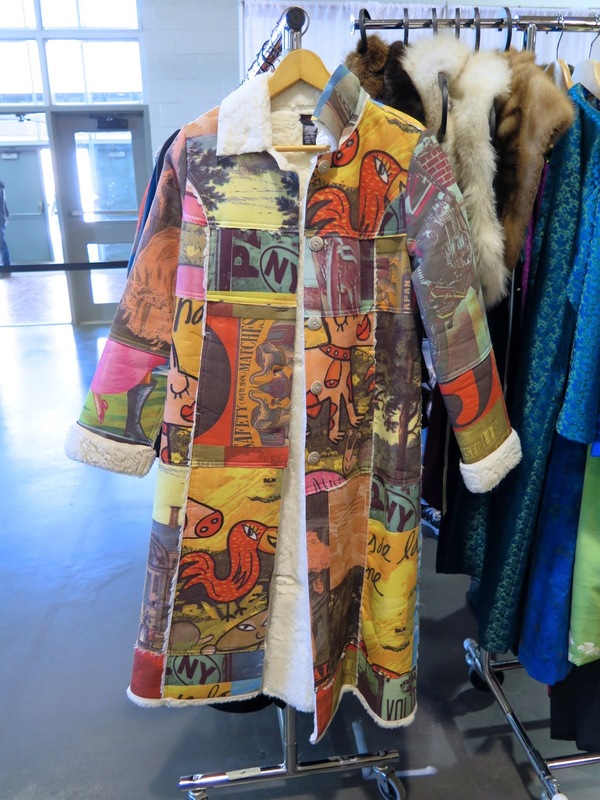 This Custo Barcelona coat from the Karen Jeffery Collection may not keep you warm in -20 below temperatures but it definitely makes a statement. I was surprised to see the number of real fur coats for sale. Given the amount of negative public reaction to the wearing of real fur, I wondered if anyone was still buying them. 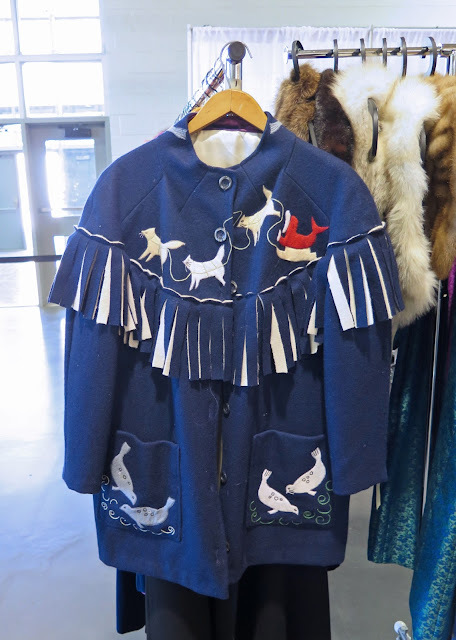 I asked a couple of vendors for their thoughts on this, and some have stopped selling real fur altogether. Others continue to sell it as long as there is a market for it. 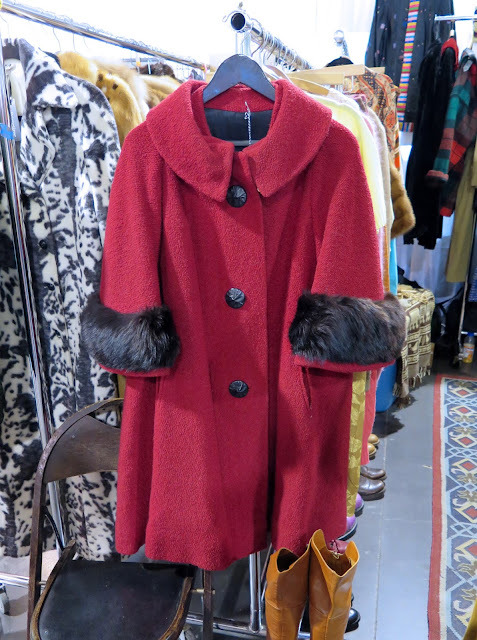 I've made my feelings known about this issue in previous blog posts, and have worn vintage fur, or fur-trimmed coats in the past. Capes have become very popular again over the last few years, and I didn't have to look very hard to find colourful examples. 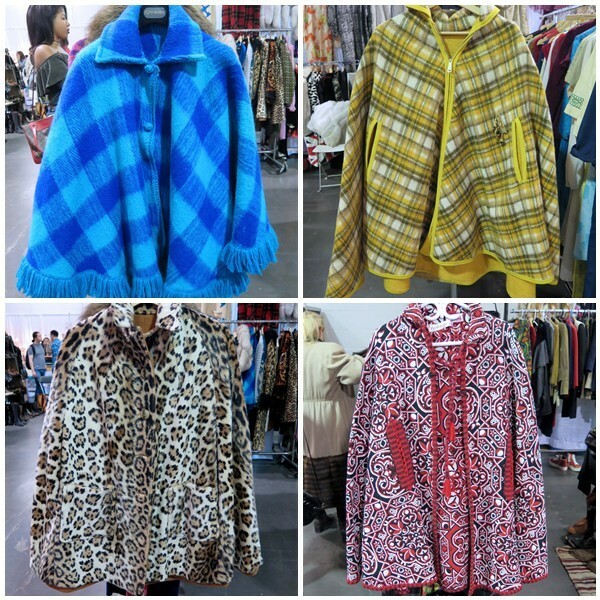 The blue check, yellow plaid and leopard print are all from Frou Frou Vintage, and the red, white and blue patterned one is from Nomadic. 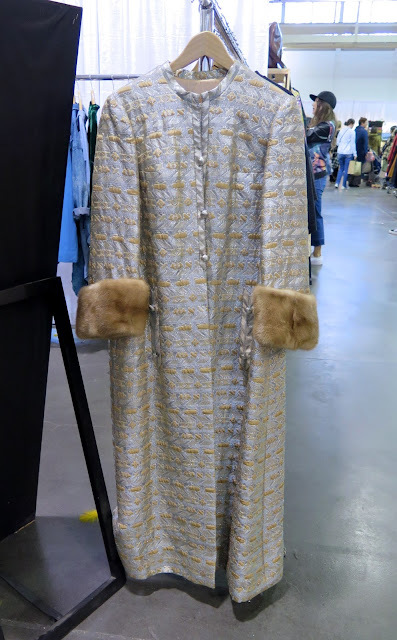 I enjoy going to vintage clothing shows to drool over beautiful pieces of clothing, but it's also fun to see what the vendors and other shoppers are wearing. Because we went on the second day of the show, we apparently missed a lot of the folks who really dress up, but the vendors didn't disappoint. The stylish owners of EVOL Vintage. He has a thing for velvet jackets (I photographed him in an emerald green one a couple of years ago) and she was rocking a fabulous vintage dress found by her husband. 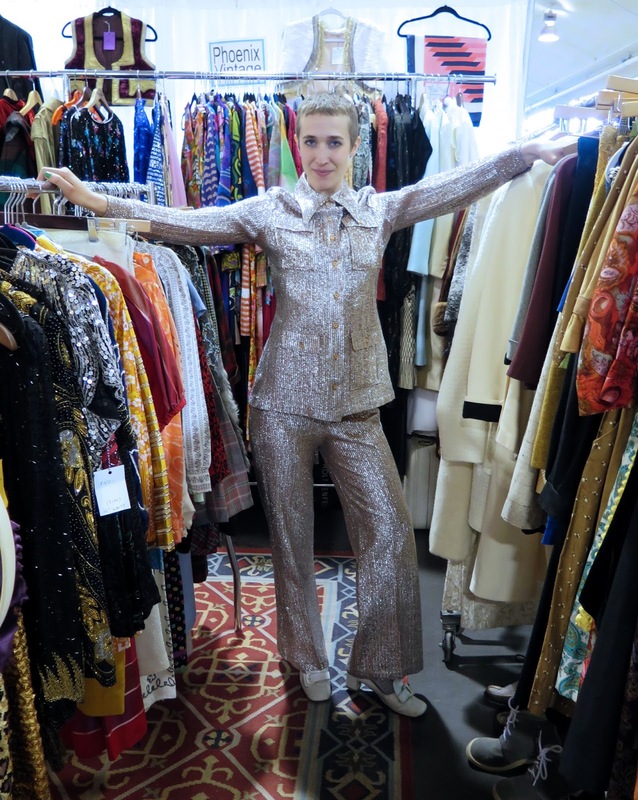 Madge Golleran, owner of Phoenix Vintage, always stands out from the crowd in her incredible outfits. For this show, she chose a lurex leisure suit, and if you thought those words couldn't possibly go together, just check out the photo above. Dana, wearing a beautiful 1940's dress, owns Victory Girl Vintage. 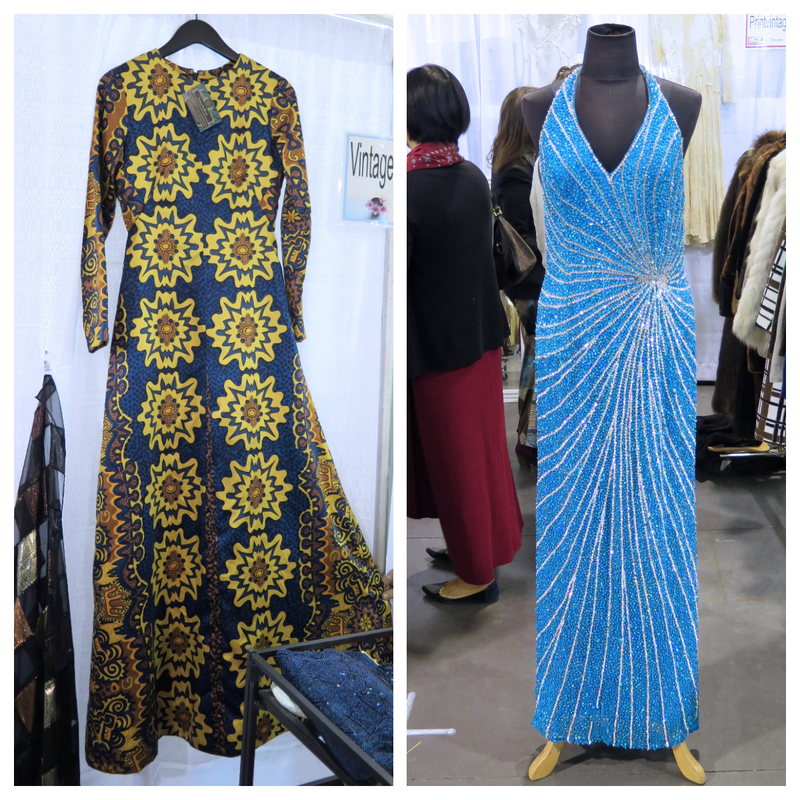 The lace dress and velvet evening coat on the mannequin next to her was available at her booth. 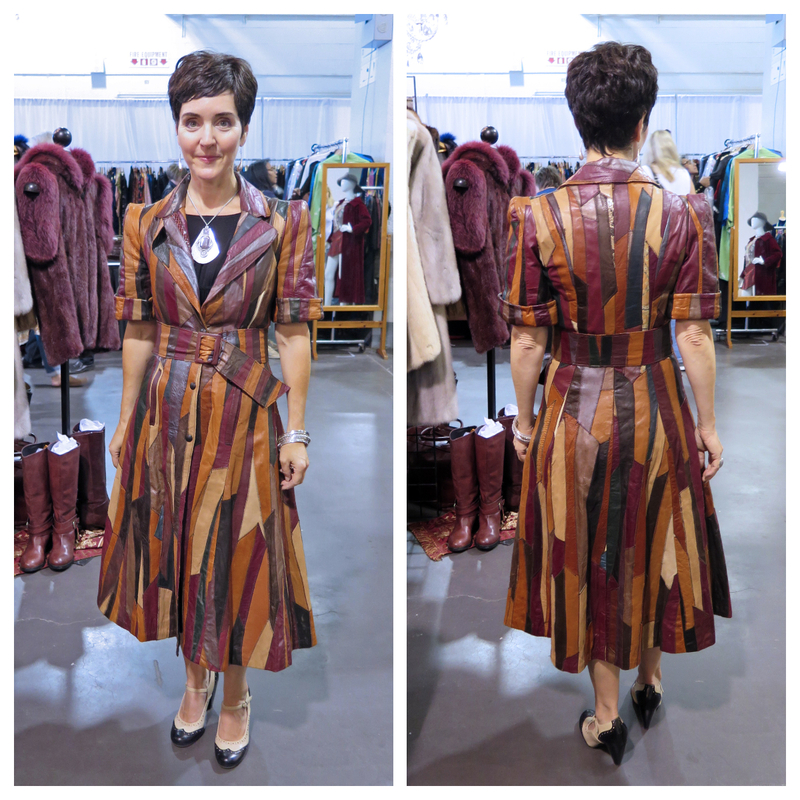 The owner of Donna Beasley Antiques (which belonged to her mother, Donna), was wearing a stunning pieced-leather dress from Ian Drummond Vintage. It fit as if it was custom-made for her. Men in their twenties could take a lesson from these two guys, who demonstrated how to do casual and denim with panache. I loved the orange sneakers, and the hats were icing on the proverbial cake. Well done, gentlemen. Of course there were lots of other fabulous things to see aside from coats, as evidenced by the photos above. The fab blue and yellow maxi on the left from Vintage Soul Geek sold just before the end of the show, and the sparkly number on the right from PrintVintage would make anyone the center of attention. 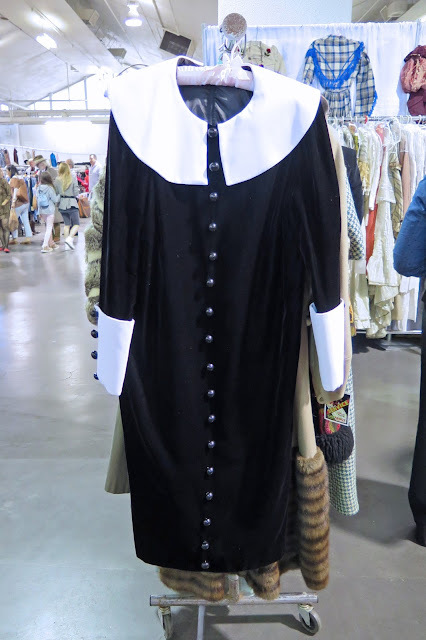 I love the graphic boldness of this velvet and satin dress from Gadabout Vintage. The gumball-sized buttons on the cuffs and front of the dress added a bit of whimsy. There is jewellery for every taste available at the show. Bracelets and graphic black and white earrings are from Renee Piche, and the saucy kittens Lea Stein brooch was available at the Vintage Soul Geek booth. These Levi's denim placemats, also from McCools Antiques, would impress your friends at your next dinner gathering. I'm sure you are wondering if I bought anything, and the answer is yes. I learned from my previous vintage show experiences that in order to stay within my budget, I need to take cash with me, and once that cash is gone, I'm done. I did very well, and found three cool pieces that in total came in just under $100. I have noticed over the past several years that anything I own that is brightly coloured or patterned, is vintage. When I buy retail, which isn't often, I tend to go for black, grey or denim. This also held true for my purchases from this show. 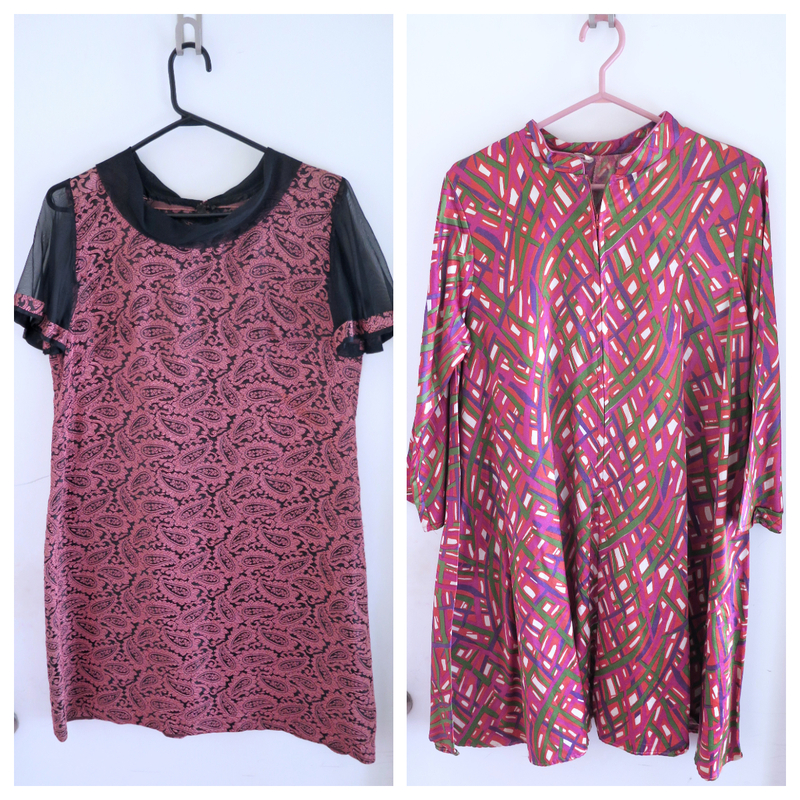 The first thing I found was this handmade pink and black dress on the left, from EVOL Vintage. It doesn't look like much on the hangar, but it fits me well and will look great with black tights and docs. I found the dress on the right at Vintage Soul Geek. I liked the 1960's trapeze shape, and the fabric is silky on the outside, and feels like a soft brushed cotton on the inside, so it will be very cozy in the winter. I wanted to post a photo of me wearing them, but it's been TOO DAMN HOT. 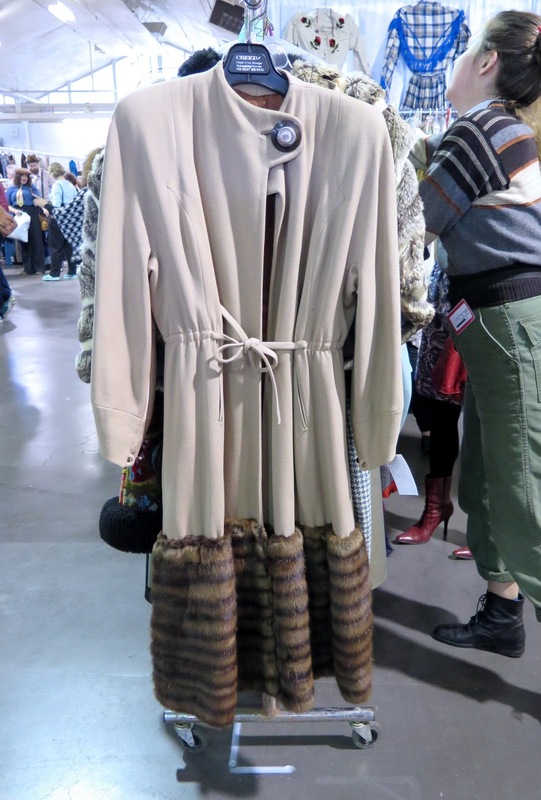 The last time I attended the Toronto Vintage Show I purchased a heavy wool maxi vest, and it appears I now have the start of a collection (I'm obviously preparing for my "Maude" years). 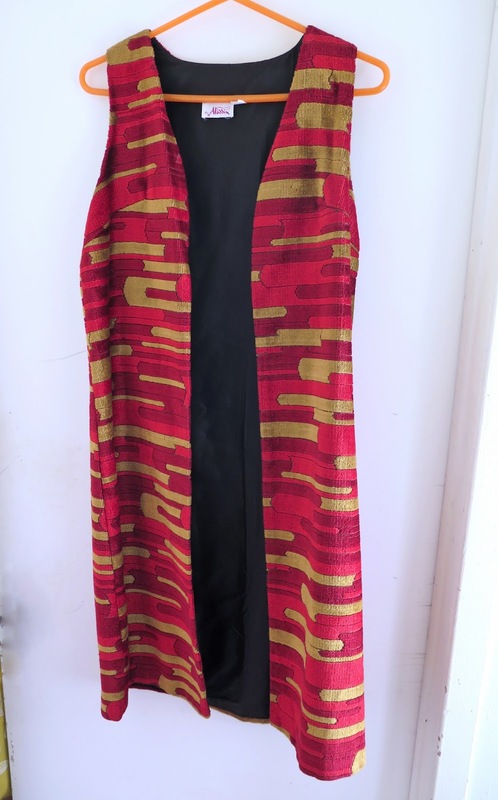 This bold number is made of what could be an upholstery fabric and is from Ian Drummond Vintage. Now all I need is some cooler weather. 1) Leave some space on your racks for clothes to "breathe". If I see a rack where the clothing is so tightly jammed together that I can't easily remove anything to see it, much less try and stuff it back in, I won't even bother to browse. 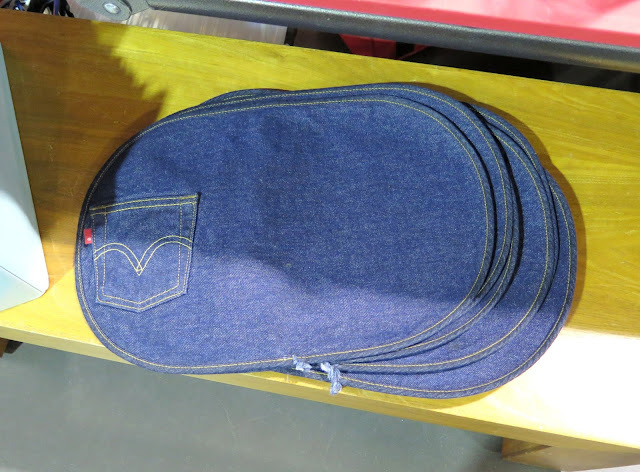 2) Examine your stock before you put it out, especially if it's an item that you are going to feature on a display. Moth holes do not make me want to take something home with me. At the very least, if something has a hole or two, acknowledge it and reflect it in the price. 3) The show has a pretty broad range of price points (my dress from EVOL was $25), and I can understand offering an exquisite vintage textile in excellent condition at a price few of us can afford, but there is no reason to charge hundreds of dollars for something unexceptional that I can find at a thrift store for $20. I know that built into that price is your time, your rent, your overhead, etc., but wouldn't you rather sell it then keep bringing it back each year? 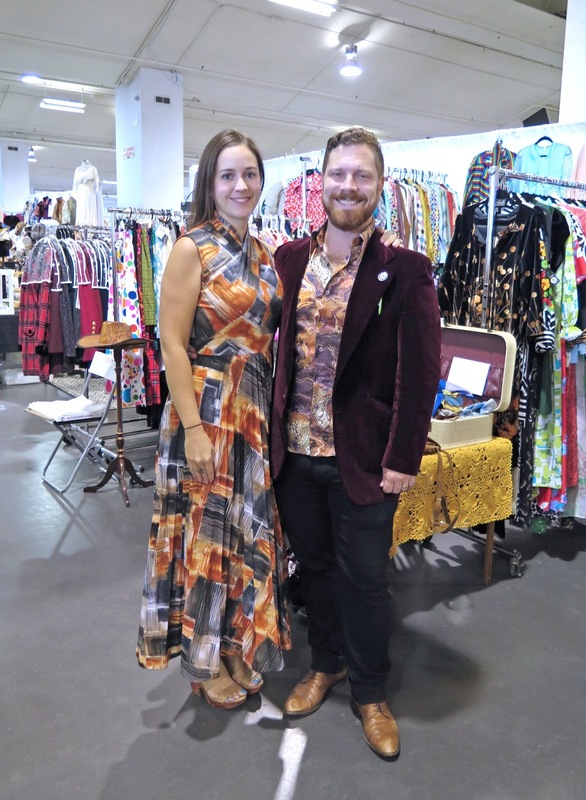 For the record, the vendors I purchased from did not have these issues, and overall, I thoroughly enjoyed the afternoon oogling beautiful clothing, and chatting to the vendors and fellow shoppers. Suzanne and I re-convened at the end of the show to compare purchases and then had a tasty dinner at Fresh before I caught my bus back home. Many thanks to Catherine Knoll for covering our admission, and to Chris McDowall for providing two admission tickets to give away to my readers. Oh, I gasped at that pieced-together leather dress - I would wear that in a heartbeat! 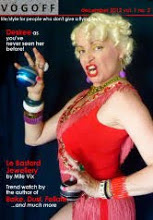 Love your purchases (the "Maude" years, hee hee! ), and I have to agree with you on the "tips for vendors." Nothing bugs me more than seeing the same overpriced necklace and earrings set for the past 3 years running! Mark that down and sell it! I hate crammed racks too. One thing that completely irritates me is no price tags on things! "Make me an offer" - NO. Make the effort to price things, and I will look and maybe buy. But if you are too damned lazy to price them, then screw you, I'm moving onto the next booth. I love the pieces you bought, especially the colourful dress. 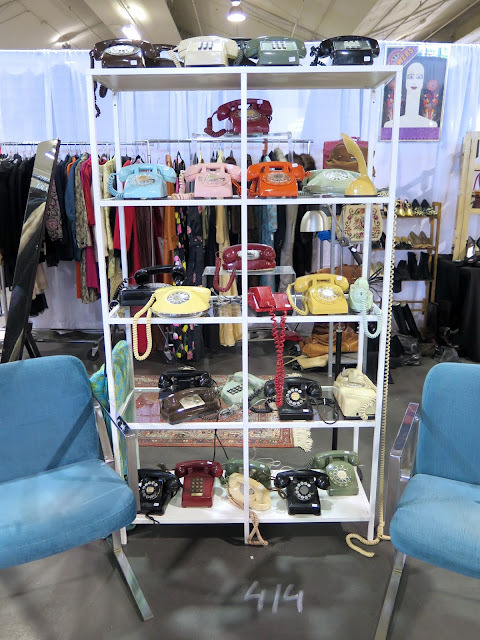 Now that you mention it, it's true how many new things lack the colour which is so abundant in vintage pieces - maybe that helps explain my love of it. The Custo Barcelona coat and Madge's vintage lurex leisure suit, oh yes, I sigh. And great photo of you and Suzanne. I'd glad you guys got to hang out for a while! Finally, your suggestions apply for any vintage or thrift shop. Oh, and I love that upholstery fabric vest!! Good one! Maude years, heh! It is shocking how many vendors don't mind putting out pieces with moth holes and stains. All of the pieces I sell are laundered and repaired and if I can't repair them I either don't sell them or sell them for a pittance. As a vendor I know about the over stuffed racks issue. The racks are expensive and it is hard to get to the show with all your inventory and your racks. As vendors we want to bring as much as we can in order to sell it. Of course though you are right, it totally turns me off if as a buyer, I can't even get the items off the rack. That reminds me of too many thrift stores that are difficult to shop in. I am also shocked how vendors manage to get away with overpricing pieces. I know personally for me, that I'd much rather sell the piece than take it back home. That of course is all within reason. I HATE buyers that come in and try to lowball me to the extent that I feel insulted. Basically I want to tell them to get the *uck out of my booth. I mean we are still there to hopefully make some cash. Aside from the few larger companies like Ian Drummond most of the smaller vendors are doing everything they can just to maintain their businesses. I LOVE that Maude vest and cannot wait to see you wear it. I spotted that woman wearing the leather dress and was so jealous. 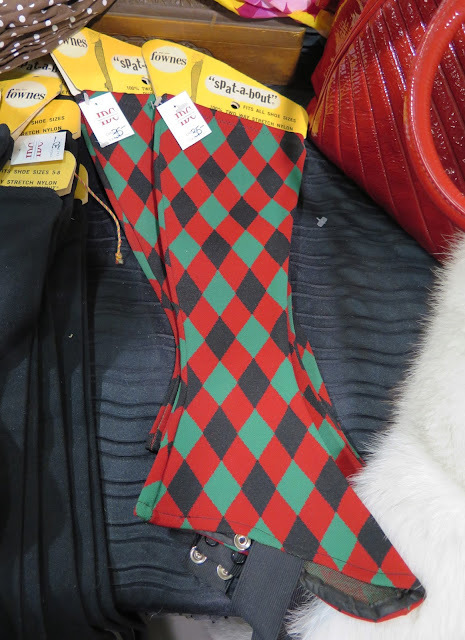 She had boots on last year that were proper Victorian boots that I wanted to buy off her feet. I think she has quite the collection in her closet. Thanks for coming with me. It was fun! You both look fabulous! I'd have been honoured if you'd paid a visit to my stall. 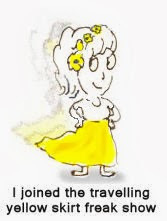 Love the blue and yellow dress and the maxi waistcoat you bought totally rocks. I knew the Custo coat wasn't vintage (the tag said it was from the 1990's), but I thought the graphic was cool. Mel’s right that modern clothes are very colour-averse compared to vintage. So I’m already in my Maude years - I love that long vest! Thanks for the tour, Shelley! The lurex suit and leather dress! Whoaaaaaa!!!!! you both look fabulous, love both styles! and so much fun to attend a vintage fair!, everybody looks so cool! 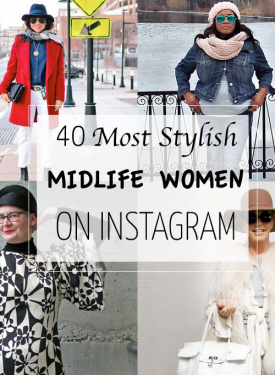 I'm in love with those ladies wearing the lurex suit and the pieced leather dress, both are fabulous!. And those lovely dapper gentlemen! Glad that you get those dresses and the colorful vest, fab purchases! I've enjoyed your 'colorful coats' show, that's a very appealing theme!. Very interesting advice too, and I took notes on wearing cash to stay in my budget! Looks like fun was had by all. But who is this Maude person everyone is mentioning??? I did notice all the cool things you bought were Mauve-ish...Can't wait to see them out and about on you. It's been freakishly warm here too. It's looks like a great vintage clothing show. Thanks to share this beautiful clothing show. I love to war stylish cloth. I believe cloth & makeup is an important part of women's life. I also love to use my beautiful perfect Liquid Matte Lipstick for my lip. I thoroughly enjoyed your post. 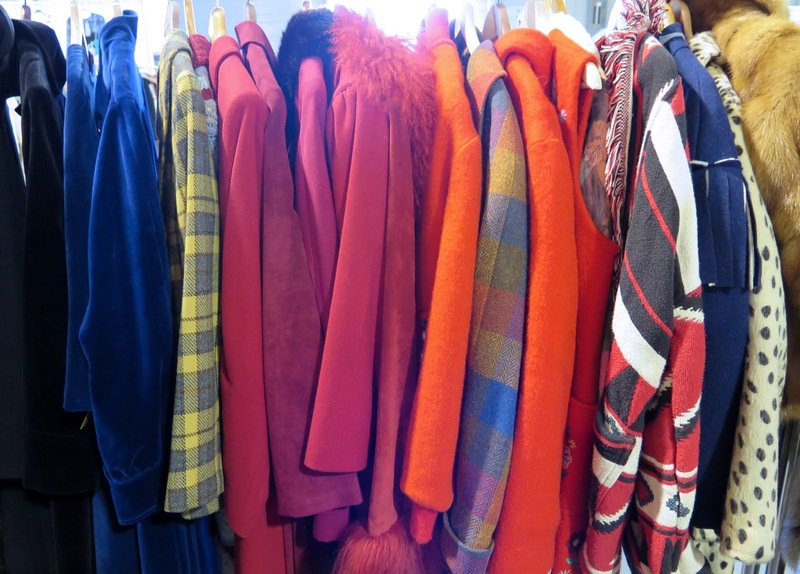 We don’t have such as extensive vintage sales like this. 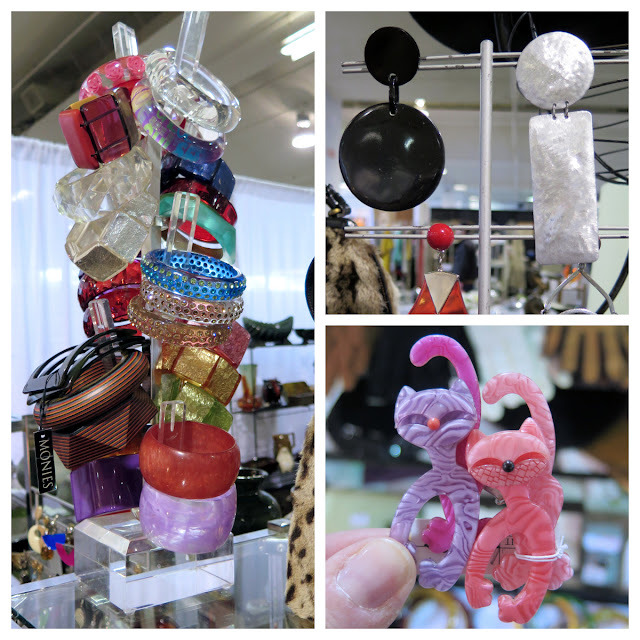 We have a big “collector items” fair twice a year which is big and beautiful. Not many clothes though. What I like about such events is the atmosphere. I think all the vendors started as collectors. Which makes them knowledgable, passionate and so easy to talk to. Just like Sheila I loved the pieced-leather dress from Ian Drummond Vintage. My goodness that is good. And as soon as I saw the leasure suit I thought of Melanie. Sure enough she commented accordingly haha.